Do you know this feeling that you want to do something and you say to yourself, ok tomorrow I’m going to start and then tomorrow comes… and you don’t start!! It could be exercising, it could be cleaning your house or even just picking up the phone to call an old friend. This is the feeling I had with this Journal. This Journal is something I always mean to do but everything else ends up taking precedence. Or is this just an excuse? For a whole year, I would start writing and then somehow, I kept stopping myself short from posting. One of the factors that kept stopping me, was fear. I kept thinking I needed to reinvent the wheel by having something original to post. This weekend I was at a two-day Mastermind event with other women entrepreneurs. I totally embraced this weekend and listened to all the advice they had to give me. What I realised was that we all are unique and it is all about taking ACTION. So, both my entrepreneurial friend and myself decided to write two blogs a week. We were inspired by another beautiful friend who always has our entrepreneurial backs who is actually doing 100 blogs in 100 days. We felt two per week suited us just fine. This got me thinking about how often we procrastinate in doing something, overtime it builds up and then it gets to the point where the task seems bigger than it actually is. Now I’m writing this post it isn’t as daunting as I thought. In fact, I’m rather enjoying it with my warm cup of English Breakfast. This can also be true for our wardrobe. 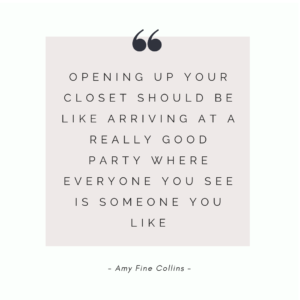 We always have the intention to organise and declutter our closets especially as we go into a new season but we never quite get round to doing it and then it gets to the point where the jobs just seems unfathomable. If you took the time to organise your wardrobe by removing clothes that don’t suit the purpose anymore and putting last season’s clothes away, you will be freeing up space for some new season pieces that you can easily mix and match with your current wardrobe. This small action of doing a Wardrobe Detox can help you build your ideal Fall wardrobe. Break the task down – Trying to do your whole wardrobe in one day will end up leaving you disarrayed and throwing everything back inside. Therefore, I would start with one category per day. Have three different piles for your clothes – Love, Give-a-way and Alteration/Drycleaning. The love pile is what you put back in your wardrobe and the other two piles require an action. Fill your space with joy – the space in your wardrobe is valuable, so why not fill it with hanging as much as you can. The more you hang the more likely you are going to wear it. Organise your wardrobe by categories – This helps with creating different outfit combinations. Pimp up your wardrobe – Make your wardrobe your sanctuary. You look at it everyday so why not make it beautiful. A quick fix is to have identical hangers. Take action now and start creating that perfect wardrobe that is unique to you.